8 Mistakes That Can Derail Your Kitchen Remodel - Classic Remodeling NW, Inc. It doesn’t matter if you’re a first time home buyer or a decades-long homeowner, fantasizing about a kitchen remodel is just plain fun. Knocking down a wall, adding an island, getting rid of those dated pine cabinets – everyone’s makeover plan is a little different, but the goal is always the same: Get the most you can out of your remodel without over spending. So when it comes to overhauling your kitchen, what sorts of mistakes will have you paying through the nose? We assembled a team of experts to identify the major mistakes you should avoid during your kitchen renovation. Don’t make the mistake of putting the cart before the horse – or in this case, putting the cabinets before the refrigerator. If you’re completely remodeling your kitchen, Alexa Battista, a Wayfair home improvement expert, recommends choosing your appliances first. “Often, shoppers are excited to get the design underway and will select countertops and cabinets first, but it’s much easier to choose countertops and cabinets to fit appliances instead of the other way around,” she says. Cabinets and appliances can make or break your kitchen- literally and figuratively. On one hand, we’ve all seen cheap – looking cabinetry and outdated refrigerators and ovens that practically ruin the look of a kitchen remodel. On the other hand, you can go broke trying to keep up with the Joneses in this area. “Don’t always think that expensive is best,” says Jonathon Faccone, founder of Halo Homebuyers, in Bridgewater, NJ. “You can get beautiful, midgrade cabinets that have the same great look and feel of higher-end cabinets for a reasonable price. “And regardless of cabinet quality, if you don’t take care of them, they will not last longer than the less expensive cabinet brand,” he adds. This advice extends to the selection of appliances as well. Installing your floor toward the beginning of the reno is a major mistake, according to Dave Murphy, national technical director at N-Hance Wood Refinishing, which does hardwood floor and kitchen cabinet refinishing. You know the adage “measure twice and cut once.” But sometimes, homeowners don’t even measure once. “The most common mistake when renovating is guessing or estimating the dimensions of fixtures, hardware, and appliances,” says Battista. She also advises homeowners to take the time to thoroughly review product details before purchasing an item to ensure that it fits. “if you’er unsure about a certain kitchen appliance or product, consult the experts, whether it’s a plumber, contractor, or customer service representative,” she says. Improper lighting is problematic in any room, but especially in the kitchen. Lively also suggests a dimmer switch and under-cabinet lighting. Lively warns that a misplace backsplash is one kitchen remodeling mistake that she often sees. Horizontally, your backsplash should have a clear termination point – either where the walls meet or in alignment with the upper cabinets. “Under no circumstances should it ever overhang the upper cabinet or, heaven forbid, turn a corner,” she says. Before you lay any flooring, J.B. Sassano, president of Mr. Handyman, says you need to make sure the floor is level. “If leveling is required, you don’t want to have the floor half-laid before you realize this,” he says. And if you think you can get away with an unlevel floor – you probably can’t. “If the kitchen floor isn’t level, the counter wont be level, unless you know you have an issue and have a strategy to deal with it,” Sassano warns. When you’re remodeling your kitchen, don’t forget to contact your insurance company to see if you need to upgrade your insurance.  We’re honored to be a part of your home remodeling process. Please use our contact form or feel free to give us a call. We’re eager to hear from you. If you’d like to receive helpful and informative tips on construction related issues from choosing the right contractor to creating the perfect space in custom home remodels … Sign up below to start receiving our newsletter! Copyright 2017 Classic Remodeling, Inc., Site by Keokee Company | media + marketing. All Right Reserved.